The Hill: Hobbiton Across the Water. So it was that during the nineteen-twenties and thirties Tolkien's imagination was running along two distinct courses that did not meet. On one side were the stories composed for mere amusement, often specifically for the entertainment of his children. On the other were the grander themes, sometimes Arthurian or Celtic, but usually associated with his own legends. J.R.R.Tolkien, A Biography was first published in 1977, four years after the death of Tolkien. Humphrey Carpenter based his biography "upon the letters, diaries, and other papers of the late Professor J.R.R.Tolkien, and upon the reminiscences of his family and friends." 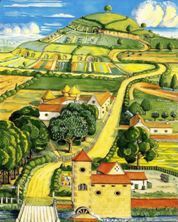 The book follows Tolkien's life from his birth in Bloemfontein, South Africa, being orphaned at an early age, the meeting and wedding of his wife Edith, the WWI years, and his return to Oxford. The book is intriging in the way that Carpenter has woven the story of Tolkien's life around the Professor's remarkable writings without attempting a critique of his work. The latter two-thirds of the book deals with Tolkien's writing and publishing of his stories. This biography, when read in conjunction with The Letters of J.R.R.Tolkien, give the reader incomparable insight into the mind of one of the 20th-century's greatest writers. To understand the man is to understand Middle-earth. ♦ Lost Tales: Here are the very beginnings of the tales of Tolkien. ♦ "He had been inside language": Here is a revealing chapter on Tolkien and languages, teaching and writing. ♦ The storyteller: This is a wonderful chapter. If you aspire to write, read on. ♦ A big risk: As amazing as the story of Peter Jackson's struggle to make a film of The Lord of the Rings is, read this chapter to learn how there was almost no book to base his movie on.